When we pilot a new project like this, we do so with the intent to test, learn and with understanding that there may be some bumps along the way. Those “bumps” help us smooth out any challenges the project might have before it becomes a permanent or large scale installation. We’ve recently had one of those bumps in our Wildlife Detection System pilot project near Elko. Radars along this particular corridor depend on their antenna spinning at a critical speed to detect roadside wildlife. One of those radars has a seized bearing which is preventing the antenna from spinning as it should. This radar has been sent for repair, which will take approximately 3-4 weeks. We hope to get more details on the cause of the issue through the repair process and are exploring the purchase of a backup unit to help reduce any future issues. In the meantime, travellers will notice the unit continues to flash a warning of the potential for wildlife in the area and advising motorists to slow down. 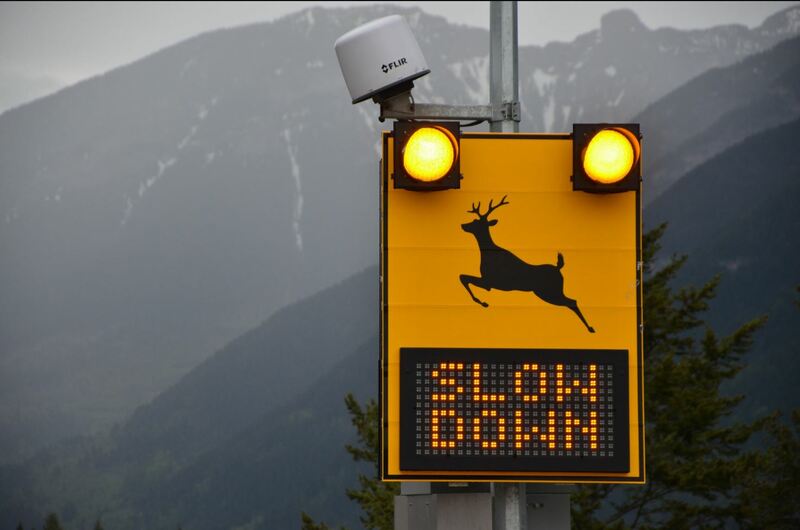 We’re trying something new to reduce deer and elk collisions where they happen most – Highway 3 between Cranbrook and the Alberta border. Ministry staff is now testing to ensure the systems, which include radar and thermal cameras, are working correctly before turning the systems on for travellers. Once activated, sensors will trigger flashing warning signs when large animals approach the highway. Meanwhile, we’ll monitor these test sites to see if the detection systems reduce the number of wildlife collisions. If successful, we’ll consider installing more wildlife detection systems at wildlife hot spots around the province. To help you picture how these systems will work, we’ve created an animated simulation. Take a look. Hello! I work with a Department of Transportation in the U.S. — south across the border from this area of Highway 3. We are trying to collect current experiences with, and/or first impressions of, Animal Detection Systems from other government transportation agencies to inform our own efforts in a rural area of the U.S. Would you be able to connect me with a representative of your project that could chat with me informally about your experiences so far? Thank you so much for your consideration! Hello and thanks for connecting with us here! Please connect with Len.Sielecki@gov.bc.ca for more information. Would love to see this implemented over the Kootenay pass. The caribou are so low in numbers now, every caribou counts. (There has been a bull & pregnant cow in the last 7 years that i know of hit on this stretch) Last summer i witnessed a very near miss when a moose walked straight across the highway in front of a vehicle late at night. Luckily the driver managed to avoid a collision, but only just! Great suggestion Bryce, we will share it along directly to the program area manager. The ministry is concerned about the Mountain Caribou herd at Kootenay Pass and has been examining potential options to protect the herd. Kootenay Pass is in a remote location on Highway 3 where electrical power and communications services are severely limited. Kootenay Pass is also subject to snow avalanches and highway closures. The avalanches make the pass a very dangerous location in the winter. Together, the remoteness of the pass and the avalanches make installing and operating a wildlife detection system at Kootenay Pass very difficult to do. Regardless, we are continuing to explore ways to work around the challenges. I am currently finishing up a film about the mountain caribou in the South Selkirk’s. I am wondering if it would be possible to use the animation for the wildlife detection system on this site in the film as something that is being considered in the effort to conserve the herd of caribou often seen over the Kootenay pass. If you would be able to contact me via email to discuss this possibility i would greatly appreciate it. I have sent you an email, as requested. I am going to roll out a fundraising campaign for wildlife protection groups. I believe that your animation for the wildlife detection system would really be of benefit for the campaign. I would truly appreciate it if I could get a copy of it. it would really be a huge boost for the campaign. The animation belongs to the Ministry of Transportation and Infrastructure, however, we can’t approve its use for monetary gain. Thanks for your suggestion to install this wildlife detection system on highways 19 and 19A. We’re still in early days for using this new system and are monitoring its performance and the results. this an amzing initiative to save wild life. definitely must be replicated in other parts of the world to save the declining wild life population and to help the drivers drive safely at night. As a frequent traveller of the road, the lights are just ignored, as they are not flashing when animals are seen, and often flashing when animals are not visible in the vicinity, or visible half way up the hillside. Thanks for connecting with us here and sharing your concern about the Wildlife Detection System on BC Highway 3. – as well as drivers not spotting the animals. The detection area is defined as 4 metres from the edge of the paint line, and animals located on the hillsides off the road will not trigger the system until they get close enough. These animals could be easily seen by motorists, yet not be close enough to the road to trigger the signs. Bicycles, pedestrians and other very slow moving ‘objects’ can also trigger the system – and would present to motorists as an event with signs flashing but no wildlife present. Finally, changing seasons present different patterns to the system in terms of vegetation and weather, and the system is undergoing a re-evaluation of current performance in summer conditions that will result in the best possible performance. We hope that this helps answer your concerns about the system. If you have any other questions, let us know. Safe travels! Very very soon. 🙂 Very. A good use of technology, if it’s scale-able then would be invaluable in places like Newfoundland to help with their moose too.